Salon owners who can master the art of entrepreneurship can stay profitable in any economy, according to the new book The A-List Salon: Insider Secrets of How Profitable Salons Wow Their Clients Every Day by Veronica Woods. Salon owners who can master the art of entrepreneurship can stay profitable in any economy, according to the new book The A-List Salon: Insider Secrets of How Profitable Salons Wow Their Clients Every Day by Veronica Woods. Many beauty and personal grooming professionals launch their businesses each year armed only with a passion for artistry without much business savvy. This book reveals how the most successful salons have both. In The A-List Salon, Woods augments her discussion of small business best practices with real-life business experiences and poignant advice from award-winning salons across the United States. In addition, she includes her consulting firm’s research results from salon guest studies to show the tie between poor business management and customer service quality. 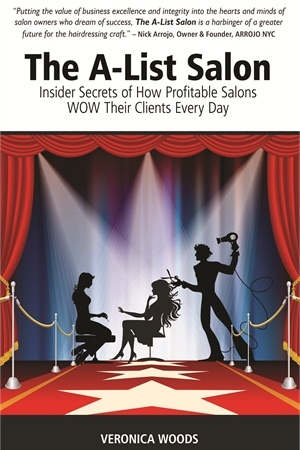 The A-List Salon is available at amazon.com and barnesandnoble.com.